What happens now that Trump has said he’ll scale back Bears Ears and Grand Staircase-Escalante? On Monday, President Trump issued two proclamations that scale back the national monument designation of some federal lands, the first time a president has reduced the size of a national monument in more than 50 years. Since then, thousands have protested the actions at the Utah state capitol, while Navajo Nation Vice President Jonathan Nez said the proclamations displayed “little respect for tribal sovereignty.” But others, like Utah Sen. Orrin Hatch and Rep. Rob Bishop, applauded the move. What will the proclamations actually do? Here’s what we know — and what’s next. What do the proclamations do? Simply, the proclamations dramatically reduce the size of two national monuments: Grand Staircase-Escalante, created by former President Bill Clinton in 1996, and Bears Ears, created late last year by former President Barack Obama. Grand Staircase-Escalante, America’s largest national monument, encompasses a series of cliffs and terraces as well as slot canyons, natural bridges, monoliths and arches. It would shrink from about 1.7 million acres to about a million acres under Trump’s proclamation. Bears Ears, two mesas and surrounding land in southeastern Utah, include areas of significant cultural significance to five Native American tribes. The proclamation shrinks the monument land from about 1.35 million acres to about 200,000 acres. U.S. President Donald Trump speaks at the Utah State Capitol, where he announced big cuts to Utah’s sprawling wilderness national monuments, in Salt Lake City, Utah. Photo by REUTERS/Kevin Lamarque. That’s the question being asked in two separate lawsuits filed in D.C. district court on Monday by the Native American Rights Fund (NARF) and The Wilderness Society. Both groups claim that under current law the president only has the right to designate land as national monuments, not the right to modify or eliminate land. The Antiquities Act of 1906 gave presidents the ability to designate federal land of historic and scientific interest as national monuments. Presidents since then have created, enlarged, and even reduced the size of monuments. However, in 1976, Congress passed the Federal Land Policy and Management Act (FLPMA), which, the lawsuits state, granted the power of monument modification solely to Congress. “No president has tried to modify or revoke a national monument since FLPMA was passed,” Matthew Campbell, senior staff attorney at NARF, told PBS NewsHour. Campbell represents three of the five tribes comprising the Bears Ears Inter-Tribal Coalition. The tribes argue in the suit that the president’s actions in Bears Ears were unlawful and exceeded his authority. The Wilderness Society filed a similar complaint regarding Grand Staircase-Escalante on Monday night. 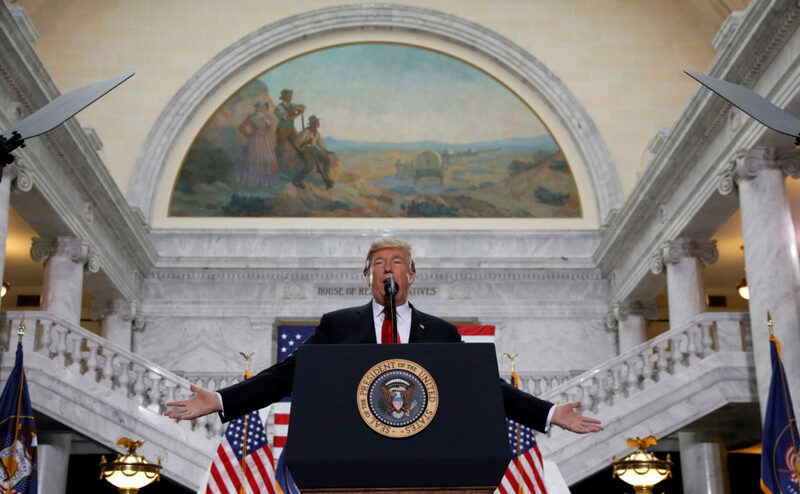 Speaking in Utah on Monday, Trump said his predecessors had “violated the spirit” of the Antiquities Act. He echoed complaints from Republican lawmakers, ranchers, and hunters, who say the government overreaches in how much land it protects and restricts, and said the land will now be restored for public use. What could happen to the land? The land will be open to all variety of private actions: corporate mining, grazing for farm animals, logging and personal recreational use. In the short-term, not a lot. The proclamation does not go into effect for 60 days, but after that, a variety of actions can be taken. Motorized vehicles, including ATVs, will be allowed on any road that existed prior to the creation of the monument. Justin Pidot, an associate professor of environmental law at the University of Denver and counsel to the three tribes filing the lawsuit, said that means any road that existed before 1996 in the Grand Staircase-Escalante can be used, even if it hasn’t been maintained in more than two decades. The spectre of an archaic mining law also hangs over the land. It allows private citizens to go out on federal land, “prospect for certain types of minerals — gold, silver, other hard rock minerals — and stake claims,” Pidot said. “And when they do that, they then acquire rights to mine those resources.” Even though the law has been debated for years, Pidot said that currently, the federal government would not have many options once someone has staked claim to land. Beyond that, the land will be open to all variety of private actions: corporate mining, grazing for farm animals, logging and personal recreational use. The government will have the option to lease land and resources, such as oil and gas, to private companies, and even potentially sell the land to the state or companies. How will the environment be affected? Phil Hanceford at The Wilderness Society said the potential environmental impacts could be huge, with mining a particular concern. Hanceford sees additional threats to migration patterns of birds and wildlife along newly reopened roads, as well as the potential for fragmentation of habitats once the land is no longer protected. Beyond flora, fauna and fossils, most of Bears Ears protects land that is integral to the five tribes that advocated for it. Campbell said tribal leaders fear grave robbing or looting of artifacts that will no longer be protected under the Antiquities Act. A multiple-use designation, intended to restore public access to the land, allows for “grazing, motorized and nonmotorized recreation, traditional tribal uses, research, hunting, minerals, etc. 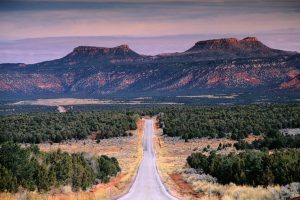 [T]here is, however, very, very little, if any, mineral energy assets in Bears Ears and we do not believe there is industry interest in the area,” Swift said. The other designation, wilderness use, limits group sizes and prohibits all vehicles with wheels (including motor vehicles, bikes, and game carts) as well as mineral energy development. Civil suits like those filed by tribal and environmental groups can take upwards of a year and a half to litigate. Civil suits like those filed by tribal and environmental groups can take upwards of a year and a half to litigate, though Campbell thinks that these might be fast tracked since the subject addresses presidential authority. For the land that has been designated as multiple use, the government said the point is to reopen the land for public access and traditional uses. We’ll know more after the 60-day waiting period expires, and the government – along with local residents, private corporations and tourists — can take action.